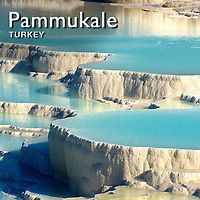 Photos of Pamukkale Turkey and pictures, photos & Images of its famous rock formations. Pamukkale, meaning "cotton palace" in Turkish, is a natural site in Denizli Province in southwestern Turkey. Springs in a cliff almost 200 m high overlooking the plain of Cürüksu in south-west Turkey, calcite-laden waters have created an unreal landscape, made up of mineral forests, petrified waterfalls and a series of terraced basins given the name of Pamukkale (Cotton Palace). Located in the province of Denizli, this extraordinary landscape was a focus of interest for visitors to the nearby Hellenistic spa town of Hierapolis, founded by the Attalid kings of Pergamom at the end of the 2nd century B.C., at the site of an ancient cult. The ancient Greco-Roman and Byzantine city of Hierapolis was built on top of the white "palace" which is in total about 2,700 metres (8,860 ft) long, 600 m (1,970 ft) wide and 160 m (525 ft) high. It can be seen from the hills on the opposite side of the valley in the town of Denizli, 20 km away. Its hot springs were also used for scouring and drying wool. Ceded to Rome in 133 B.C., Hierapolis flourished, reaching its peak of importance in the 2nd and 3rd centuries A.D., having been destroyed by an earthquake in 60 A.D. and rebuilt. Remains of the Greco-Roman period include baths, temple ruins, a monumental arch, a nymphaeum, a necropolis and a theatre. Following the acceptance of Christianity by the emperor Constantine and his establishment of Constantinople as the ‘new Rome’ in 330 A.D., the town was made a bishopric. As the place of St. Philip’s martyrdom in 80 A.D., commemerated by his Martyrium building in the 5th century, Hierapolis with its several churches became an important religious center for the Eastern Roman Empire.